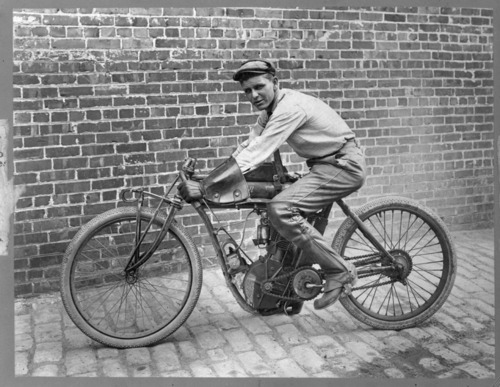 Wells Bennett, pictured here circa 1910, was one of the nation's top motorcycle competitors in the 1910s and early 1920s. Born in Wichita in 1891, Bennett entered his first race at the age of 15. Within five years, he was a leading Kansas dirt track racer. While visiting Denver in 1912, Bennett was introduced to board track racing, whose events were contested on an oval wooden track with steeply-banked turns. He won the first board track race he entered and soon left Kansas to compete at board tracks across the country. As his career progressed, Bennett shifted his attention to endurance, hill-climbing, and long-distance cross-country events. He competed at the upper echelons of his sport and set several records. He also worked as a stunt rider in Hollywood. Bennett's most notable achievements occurred in the early 1920s. On May 30-31, 1922, Bennett established a 24-hour distance record that remained unbroken for 15 years. Riding his Henderson 4 motorcycle on a board track in Tacoma, Washington, he traveled 1,562.54 miles during the 24-hour period. Later in 1922, Bennett set a transcontinental record when he rode from Los Angeles to New York in 6 days, 16 hours and 13 minutes. In August 1923, he captured the Three-Flags Run title by riding from the Canadian border near Blaine, Washington to Tijuana, Mexico in 42 hours and 44 minutes. Bennett retired from competitive racing in the mid-1920s. He ran a motorcycle dealership in Portland, Oregon, until 1930; worked as a service representative for Ford Motor Company; and then purchased a ranch near Mt. Hood. He died in Oregon on May 31, 1969. In 2000, Wells Bennett was inducted into the national Motorcycle Hall of Fame. The Hall of Fame describes Bennett as "one of the pioneers of motorcycle racing," and "one of the greatest cross-country riders of all time." Wells Bennett, pictured here circa 1910, was one of the nation's top motorcycle competitors in the 1910s and early 1920s. Born in Wichita in 1891, Bennett entered his first race at the age of 15. Within five years, he was a leading Kansas dirt track racer. While visiting Denver in 1912, Bennett was introduced to board track racing, whose events were contested on an oval wooden track with steeply-banked turns. He won the first board track race he entered and soon left Kansas to compete at board tracks across the country. As his career progressed, Bennett shifted his attention to endurance, hill-climbing, and long-distance cross-country events. He competed at the upper echelons of his sport and set several records. He also worked as a stunt rider in Hollywood. Bennett's most notable achievements occurred in the early 1920s. On May 30-31, 1922, Bennett established a 24-hour distance record that remained unbroken for 15 years. Riding his Henderson 4 motorcycle on a board track in Tacoma, Washington, he traveled 1,562.54 miles during the 24-hour period. Later in 1922, Bennett set a transcontinental record when he rode from Los Angeles to New York in 6 days, 16 hours and 13 minutes. In August 1923, he captured the Three-Flags Run title by riding from the Canadian border near Blaine, Washington to Tijuana, Mexico in 42 hours and 44 minutes. Bennett retired from competitive racing in the mid-1920s. He ran a motorcycle dealership in Portland, Oregon, until 1930; worked as a service representative for Ford Motor Company; and then purchased a ranch near Mt. Hood. He died in Oregon on May 31, 1969. In 2000, Wells Bennett was inducted into the national Motorcycle Hall of Fame. The Hall of Fame describes Bennett as "one of the pioneers of motorcycle racing," and "one of the greatest cross-country riders of all time."